FRANKSTON YCW have shocked football fans across the peninsula by bowing out of finals in just the second week. The Stonecats were put to the sword by Mt Eliza in a stunning come from behind victory. The Stonecats suffered a blow pregame with Paul Minchington ruled out due to a calf injury. Minchington booted five goals last week to help his team to a win. Despite their injury concerns, Frankston YCW got off to a blinding start, dominating the Redlegs throughout the first half. The Stonecats were absolutely in control at the half time break, with Mt Eliza’s skills by foot letting them down on multiple occasions. Despite having their backs to the wall, the Redlegs looked like a transformed team in the second half, playing a much more physically dominant style of play. The biggest change for Mt Eliza in the second half came through Jordan Moncrieff, who set the game alight. After a relatively quiet one goal first half, Moncrieff piled on six majors in the second half to drag his side back into the contest. Against all odds, the Redlegs snatched the lead with seconds to play in the third term, and held onto their lead throughout the last quarter to run out unlikely 11.9 (75) to 8.11 (59) winners. The loss ends a difficult year for the Stonecats, who were ravaged by injury and went eight matches without a win throughout the middle of the year. Frankston YCW have won seven of the last eight Grand Finals they have contested, but will now not have the chance to contest another one after stumbling before the finish line. While there was disappointment for the Stonecats, there was elation for Mt Eliza. 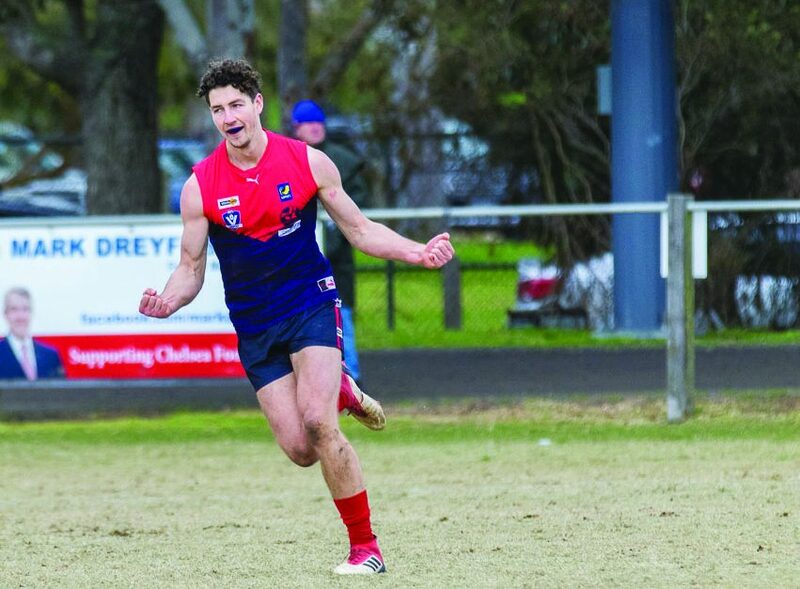 After a disappointing loss to Pines last week, the Redlegs reminded everyone of their class to book a spot in the preliminary final on Sunday at Frankston Park. Mt Eliza will take on Sorrento in the Preliminary Final, after Pines beat them in a hard fought contest at Alexandra Park. Pines have been the inform side in the competition, and had beaten Sorrento by three points in their previous outing. Both sides traded blows in a tight and competitive first half, before Pines started to pull away. Only eight points separated the sides going into the last quarter, but the Pythonds held on to claim the 11.16 (82) to 14.11 (95) win and claim their spot in the Grand Final, their first since 2002. Perry Lewis-Smith, Aaron Edwards, Daniel Johns, and Luke Potts were Pines’ best in the victory.